Innovative, cutting-edge, technologically advanced design. 1.0 mm full grain leather construction. 1" dual density foam padding. Ultra soft microfiber inner lining. Anatomical rear head pad for a perfect fit every time. 3-way hook-and-loop adjustment. Heavy-duty nickel clad chin-strap buckle. State-of-the-art "Microfiber" lining. Micro injected logos front and back. 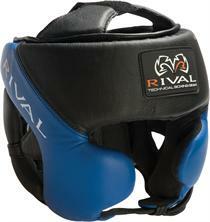 Email your friend about the Rival Hi Perf Training Headgear. Ask a question about the Rival Hi Perf Training Headgear.